There is a common misconception among gardeners that the secret to bountiful and productive vegetable gardens has to be some sort of magic combination of fertilizers and pesticides. Every year seed and garden catalogs, nursery staff, and our fellow community gardeners tout the latest products that promise to cure all of our garden woes. Most of the time these concoctions are just different mixes of the same old ingredients wrapped up in a new fancy package. When it comes to organic gardening not a lot has changed in the last couple hundred years so these companies have to repackage the same old thing to try and make it interesting. The cool thing about plants is they don't really care about fancy packaging or exotic ingredients from far away lands. All plants need to thrive is healthy soil and all we need to create healthy soil is a little compost, a little bit of love, and a whole lot of patience. That's right, repairing damaged soils doesn't happen over night, but if you start to follow some of the following practices, I guarantee you will restore the health to your soil your gardening will become easier and more enjoyable at the same time. Contains high levels of relatively fresh organic residues, to provide beneficials with food. Includes high levels of decomposed organic matter that retain nutrients and moisture. Contains low levels of toxic compounds and low levels of concentrated salts. Supports adequate levels of nutrients, not exceeding recommended requirements. Has a sufficiently porous surface with pores connecting the top soil to the deep subsoil. Has good tilth and structure that allows roots to easily penetrate and spread. Now that we know what we hope to achieve in our soils, lets talk about some ways that we can help work towards this goal. If you could only do one thing to improve the health of your soil it should be adding compost. In fact, if you're hoping to start a vegetable garden in our nutrient depleted desert soil then compost is not just an option but an absolute must. Desert soils suffer from many issues including compaction and high pH making it difficult to support non-native plants like common vegetables. Compost can help to alleviate these issues and many others while at the same time introducing beneficial microorganisms to the soil that will help kick-start the soil food web into high gear. When starting a new garden, it can be necessary to replace up to 50% of our native desert soil with compost. 2. Leave the Leaves...and the Weeds Too! No one fertilizes in nature. Instead leaves fall on the surface of the soil and decompose reintroducing nutrients back into the soil for plants to use again. One of the simplest and easiest ways you can introduce organic matter into your soil is to allow leaves that fall on the soil to naturally decompose in place. Over time leaves, seed pods, and weeds will break down and provide nutrients back to the soil. Furthermore the free mulch will also help to conserve water and create a place for insects and wildlife to thrive. If weeds haven't gone to seed and are not invasive, pull them out by the root and lay them on the surface of the soil. Weeds with deep tap roots will open open the soil allowing water to penetrate deep. Use a pair of pliers to pull out tough mesquite and palo verde saplings. Technically anything that covers the surface of the soil can be considered a "mulch". 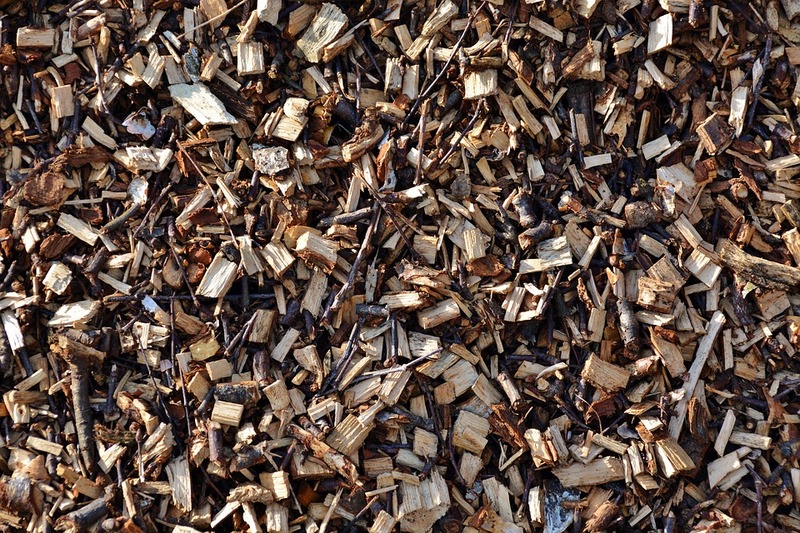 Wood chips, straw, and rock gravel are some of the most commonly used mulches around Tucson, however there are many others. The best mulch to use in your vegetable garden is Alfalfa Hay that is lightly worked into the top two inches of soil. Not to be confused with straw, which is the by-product of grain production, alfalfa hay is harvested fresh while the alfalfa plant is still green. Because the plant is harvested while still alive, the nitrogen content is far higher than with straw so when it breaks down it provides a rich source of nitrogen back to the soil. While straw is a little bit cheaper, it takes longer to breakdown and can actually take nitrogen out of the soil in the process. If a large quantity is needed, consider "Cow Hay" which is regular alfalfa hay that has been rained on and has begun to get moldy. While not safe to feed horses, it's perfect for mulch or compost. Certain times of the year you can buy it cheaply by the ton making it some of the best mulch in the gulch! While vegetable gardens and annual flowers thrive in soils mulched with alfalfa hay worked into the soil, most landscape plants like trees and shrubs prefer to grow in soils mulched on the surface with wood chips. You don't need much, 2 to 3 inches is more than adequate. Any more than that then you'll keep valuable rain from reaching the root zone of plants and inhibit the soil food web from growing. Mulching with wood chips will have several added benefits in the landscape as it will keep the soil moist and prevent weeds from germinating. When it comes to mulch, think "Biologic" not "Geologic". Never mind the environmental implications of gravel mining, when used in the landscape gravel mulch has a terrible effect on the soil. During the heat of the day the gravel radiates heat into the soil cooking off any and all life that may be present. It becomes difficult to grow plants and wildlife stays far away. Gravel also retains the heat of the day adding to higher cooling costs to to your home and contributing greatly to the urban heat island effect. In our opinion, a yard full of weeds is a far more beautiful thing than your average manicured suburban lot. While moderate applications of compost to the soil are important, occasional applications of Active Aerated Compost Tea can help to boost your soil health to the next level. Allowing compost to seep in 5 gallons of dechlorinated water overnight is the simplest way to make compost tea, however this method can be unsafe and is not recommended. Instead, a more effective method is to incorporate an air pump, air-stones and an added sugar source to boost the production of microorganisms. Depending on which type of compost you use and which ingredients you add to your brew will change which microorganisms you produce. To make compost tea you'll need a food grade 5 gallon bucket, an air-pump and stones, fresh compost, and a sugar source like molasses. Other ingredients like sea kelp and yucca extract can be added to make more exotic teas and help to diversify your soil food web. One of the leading causes of Soil Degradation around the world is the mechanized tillage of the soil at the beginning and end of each season. While the act of rototilling appears to have beneficial effects in all actually it destroys the quality of the soil over time. A tomato grown in a field today is 30% less nutritious than a tomato grown in that same field 30 years ago. In fact, one third of the worlds farmland has been completely destroyed in just the last 40 years and nearly half of what remains is considered "degraded" or worse. The Future of Agriculture will depend on low impact farming techniques like no-till farming. You to can make a big impact in your garden by converting over to no-till. At the end of each season, rather than pulling crops out by the root, cut the stem at soil level and allow the roots to decompose naturally underground. By eliminating the tilling process, you'll keep the soil food web in tact so that the next generation of plants can benefit. Overtime, roots will open up the soil allowing water to penetrate deep into the subsoil, turning your garden into a living sponge. The best part of no-till gardening is that it is actually less work for you, so why not give it a shot? It probably goes without saying that if you're reading this blog you probably wouldn't dare to use a synthetic pesticide or fertilizer in the garden.This is good because synthetic pesticides like Round-Up and fertilizers like Amonium Nitrate can kill of the soil food web in an instant. But honestly how many of you as strongly about using Neem oil, insecticidal soap, or releasing purchased lady bugs? Well intended organic gardeners usually operate with the mindset that they are doing the right thing when they replace highly toxic chemical pesticides with organic alternatives that are supposed to be less toxic. The message I hope to get across is that more often than not doing nothing is a far better option than either. Seeing a weed or a bug and immediately reaching for the spray shouldn't be the mindset of an organic gardener. Spray and pray is the mindset of a conventional farmer, and it is destroying the planet. An organic gardener should strive to build up the soil food web by eliminating the use of broad spectrum organic pesticides that can have negative effects on the garden ecosystem. Over time as bio-diversity increases in the garden and soil becomes healthier the need for these products will be eliminated because the plants will begin to take care of themselves. What we feed our soil should also come from as close to home as possible. Fertilizers shipped across the world aren't sustainable. Whenever possible try and use fertilizers made from plants and source them as close as home as possible! When you start to have the mindset that feeding the soil is more important than feeding the plants, you'll start to recognize the importance of cover cropping your rows every couple of seasons. Over time, continually growing crops like vegetable can deplete to soil of valuable nutrients. To restore nutrients to the soil, a cover crop is grown in place of a cash crop. Cover crops do two things, fix nitrogen and create "bio-mass". Legume crops like beans, peas, and vetches have a unique ability to take abundant atmospheric nitrogen and convert into a form that plants can use. They do this with the help of a specialized soil bacteria called rhizobium. Your cover crop will fix more nitrogen if you mix rhizobium inoculant with the seeds at the time of planting. The second kind of cover crop is one that produces "bio-mass" which is just a fancy way to say green plant material. The more bio-mass created then the more organic matter can be reintroduced back into the soil. Many cover crops can be chopped down two or even three times during the growing season and will continue to grow. At the end of the season, chop all of the plants down at soil level and cover with compost. Allow the plants to naturally decompose in the soil before planting next seasons crops.